The Russian president has promised to sort out the authorities in Lytkarino who tried to hide the town’s poor state from him. ­Heading to the town for a meeting devoted to professional education issues on Wednesday, Dmitry Medvedev ordered for his car to be stopped as he wanted to see if numerous complaints on the internet from people living in the town were true. Most locals who gathered nearby confirmed that one part of the road was repaired before Medvedev’s visit, and the other was fenced off. 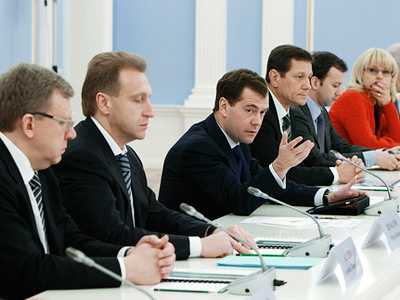 After people complained that repair work is usually done only when high officials come to town, Medvedev agreed. “This is bad, I will sort it out,” he promised. The head of Lytkarino administration later explained why he did not answer Medvedev’s criticism immediately. “I can’t interrupt the president. Now I will be explaining it.” He stressed people have not got accustomed to changes that have already begun in the town. “I’m a new head, I was elected last year,” Seregin said. The president earlier warned that he would change his itineraries while visiting Russian regions to see the real state of towns. Several days before his arrival to Lytkarino, many local people wrote online that the authorities were taking extraordinary measures to put the town in order. The presidential administration’s officials noted there had not been so many complaints about the state of a town for a long time. Many dilapidated houses were covered with screens to imitate repair works, locals said. A fence near one of the schools was painted, but only on one side, where the presidential motorcade was to pass by, RIA Novosti reports. The internet comments say that the authorities in the town “don’t do anything,” Medvedev told Moscow Region governor Boris Gromov. 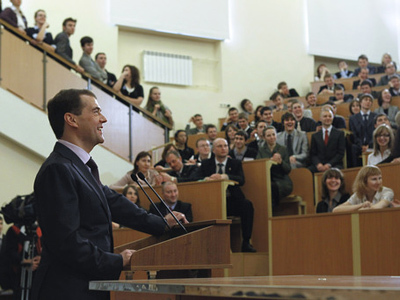 During a meeting with students of vocational schools in the region, Medvedev criticized the local authorities again for building “Potemkin villages” before his visit. 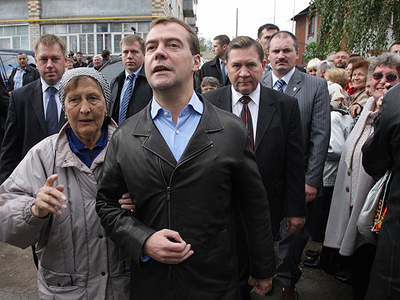 Earlier this month, Medvedev suggested that heads of municipal bodies should also check the real situation instead of visiting scheduled places. He said many people complained during his visits that “the main street was painted, new planting was arranged, and nothing more was done – please see how a yard, a porch looks.” He said he would regularly make such inspections in the future himself.